With GW36 rolled up & put away neatly in a safe place, let’s have a glance back at the action. Benitez’ rejuvenated Magpies hauled themselves out of the mire with a slim victory over a struggling Palace side as their neighbours, still with a game in hand stayed in touch thanks to a last minute Defoe penalty. A Mark Noble brace propelled the Hammers to a comfortable away win at West Brom & Norwich succumbed to a single Gunners goal that leaves the second from bottom. Villa threatened to go out on a blaze of glory until Troy Deeney snatched a late win for Watford. Both City & Liverpool, looking a tad ragged from European commitments, suffered away defeats just before the nation (& most of the rest of the world) changed channel for the Manc Untidy, Leicester match. The Foxes only needing one win to secure the title had to put the champers on ice, as Untidy held them to a draw in a game where Drinkwater saw red & Foulaini escaped punishment for elbowing Huth after seemingly having his hair pulled in an incident described by LVG as not okay in football, but okay in sado-masochism. So, for the last match of the GW, the Leicester team all piled round to Vardy’s gaff to cheer on Chelski in the Monday match against Spurs. A hush descended on the living room as Spurs took a two goal lead going into the second half, but this was soon turned to wild screams as Chelski eventually pulled level by the man who didn’t want Spurs to win the league, Eden Hazard, leaving Vardy & his missus having to clean up all manner of drink stains from the living room carpet the following morning. Ranieri insists he’s not looking to have big names & at a champagne drenched presser unleashed his “dilly ding dilly dong” much to the joy of the hoard of sports hacks in attendance. 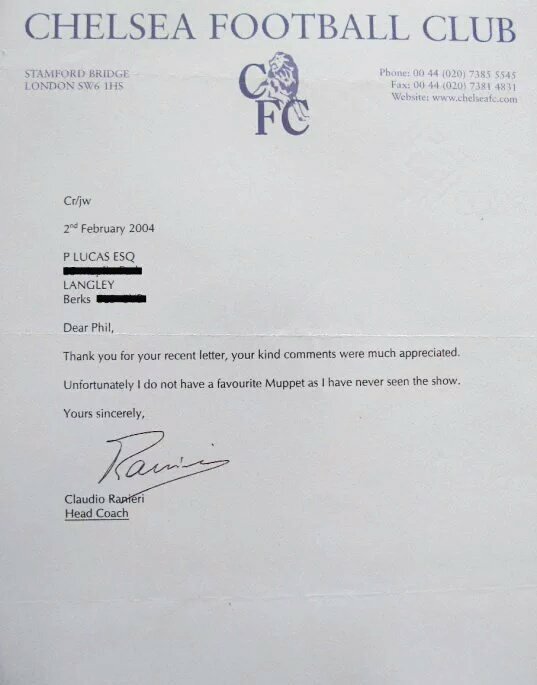 However, after 11 years, he still remains tight lipped over his favourite muppet. But, leaving the trifling things aside, in the FPL the IGM continue with their one way ticket to the main attraction & swept the GW by 31 points (478 - 447) & now hold a 1001 point lead overall. In the H2H league fortune continues to smile on the IGM, taking an 18 - 15 win to extend their lead to 31 points. The pitch is looking great despite the lack of lawn mower due to the unfortunate pond incident. A bit of rolling & the grass should lie a bit flatter I think. Righto you lot. Welcome again to the Stadium of Faith for your GW37 thread. Huth and Fellaini are both banned for rest of season and first game of next. this leaves me in a bit of a hole. i have 1 transfer. it's a double game week for a lot of teams and i've got some who only play one game. sacrificing points might have to happen. Oh i wouldn't really worry about shipping points. With IGM 1001 in front, it won't really matter. Back into main pc at home and forums after a week off trying to do basic things with wifis here and there. Pick this one to rest Rashford. bloody idiot. Rashford is one of the only good things they have. needs a rest, my arse. he's 19. Just saw this on twitter. Very subtle huh? What happened to West Ham? and i actually left aderweireld on, not daniels! wtf?